Discover Punta del Este, also known as Queen of Summer, a Latin American seaside resort famous for its nightlife and cultural activities. A popular holiday destination for VIPs and rich entrepreneurs, it presents a unique combination of urban life, reflected in its Hollywood-style architecture, and nature, with the coast and vast stretches of pine trees in residential neighbourhoods. We leave the port behind and head towards Punta Ballena, a long itinerary that passes through the beautiful residential neighbourhoods of Pinares, Beverly Hills, Portozuelo and San Rafael, where we see numerous villas immersed in nature, as well as Playa Mansa and Playa Brava. 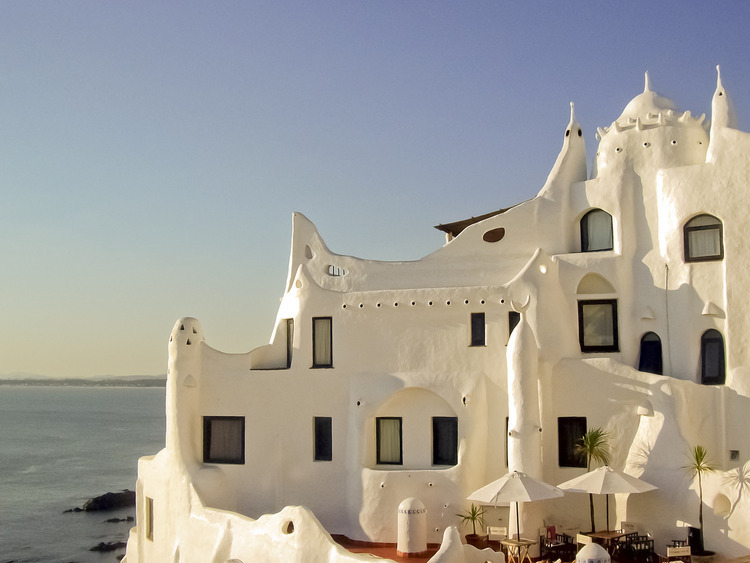 We then make our way towards the fabulous Casapueblo in Punta Ballena, just a few km from Punta del Este. Casapueblo is a housing complex and cultural centre designed by the famous Uruguayan artist Carlos Paez Vilaró and built on a cliff, offering amazing sea views. We then stop in the lively Avenida Gorlero, a long street lined with bars, restaurants and shops where we have some free time to have a bite to eat or do some shopping.